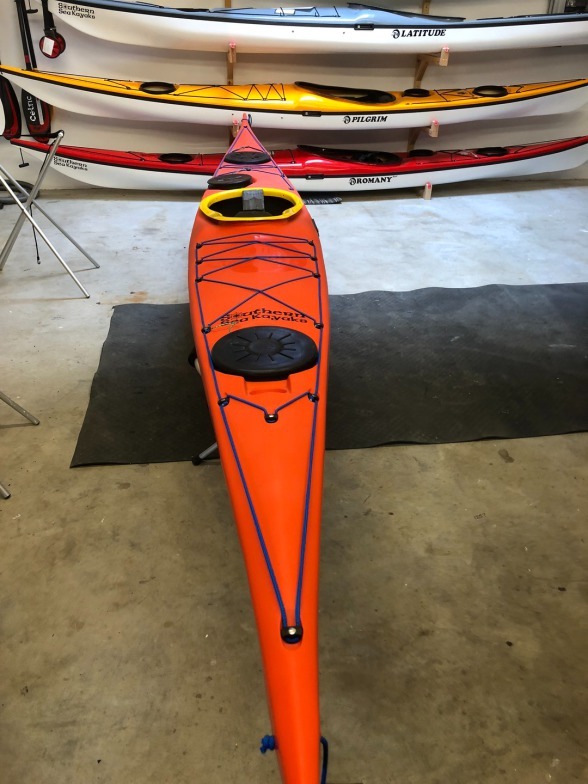 This kayak is an excellent choice for the decerning rockhopper and day tourer. The plastic is very strong stiff linear plastic, with double bulkheads either side of the cockpit. Designed for the small to medium sized paddler upto around 75kgs. 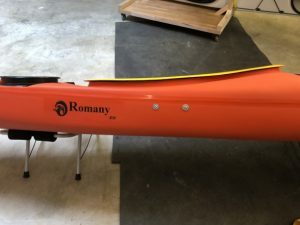 It feels as stiff as a composite kayak, it definitely lacks the bouncy flex associated with most rotomoulded kayaks, with its strong single skin its still relatively light to carry (23-24kg), this kayak will impress seasoned kayakers and novices alike. This is the all new Romany Sportive, completely new design, and eagerly anticipated big hit with rockhoppers designed to be the smaller sister of the Romany Sport (RM) and having paddled it at the recent dealers meet I can assure you that one of the 6 that I have on pre-order is mine, keep an eye on the page for when it arrives here and be one of the first in the world to paddle this remarkable little romany. 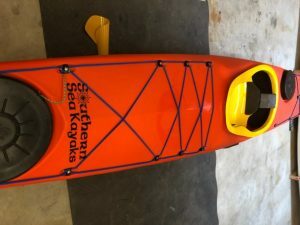 These boat stock have a set coloured rim and seat but these are interchangable at no cost, Southern Sea Kayaks has chosen to sell all boats that are pre ordered with black rims and seats. 10 good reasons to buy an NDK sport or sportive. 2. 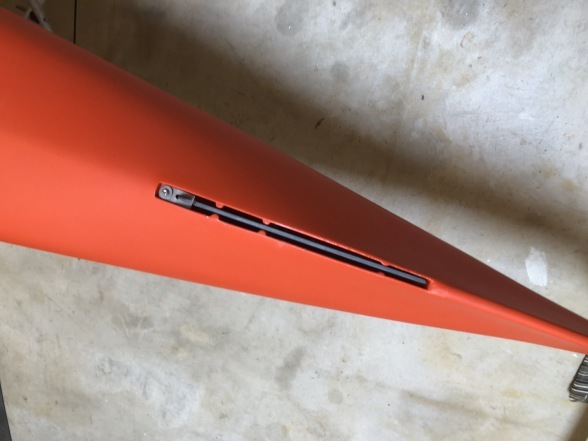 A proper wire skeg as fitted to all SKUK kayaks as standard, but because it’s an NDK kayak its designed so that you only need in in high winds and not to compensate for a poor design. 3. Proper fitted day hatch rim makes access to your most important items easy. 4. Fibreglass cockpit rim, helps increase the kayaks stiffness and makes it much easier to fit a spraydeck to, also keeps weight down. 6. Proper metal footpegs! the plastic offerings used by other manufacturers are terrible, worse case they break when pressure is applied but generally they are springy which can further reduce the effectiveness of your forward paddling. 7. Solid multi thickness of quality plastic, other manufacturers use triple layer for good reason, the lamination stiffens their design, it reduces the weight, and more importantly it reduces THEIR cost, but if it cracks it can be virtually impossible to effectively repair because the external skin (the decent bit) is way too thin and water penetrates between the layers making it very difficult dry out and weld. 8. Easy ability to outfit and adjust to suit most body shapes. 9. Single cord carry toggles which stop fingers from becoming trapped in an ever tightening loop, especially bad for a swimmer in rough water but also surf landings, the single cord is the same strength as the loop! 10, 100mm bulkheads, yep thats 100mm 2 pieces of foam securely glued in and together to make this as tough and waterproof as possible. There are many more reasons, if you need to know more, then why not come and see this amazing kayak or its big brother the Romany Sport at Southern Sea Kayaks.